I’m not going to say I was relieved exactly when Ellie threw up Saturday morning and we had to change back to diapers and cuddle on the couch and watch TV but…it was a nice break. Especially since she seemed to feel better right away and was fine the rest of the weekend. 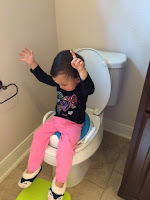 I don’t know what’s worse, spending all day on the toilet with her while she does NOTHING (then pees as soon as I get her off), her holding her poo because she’s scared to go in the potty (and then I’m scared she’s going to get constipated) or the fact that I’m stuck in the house while all this goes down and I don’t know when things will ‘click’. Just FYI - cleaning pee from the car seat, or trying to catch it dripping through the grocery cart at Target is not my idea of a good time. Sometimes, even though I can’t imagine anyone else taking care of Ellie but me, EVER, I feel like maybe I’m not cut out for stay-at-home-mom-hood. Really. This is...really hard. Even though I had her signed up for two mornings a week at the day care in June and I totally pushed it off until September because SHE’S MY BABY AND I’M NOT READY TO HAND HER OVER TO YOU YET, OK!? Still, this hood…it makes me a little…stir crazy. We go out every morning, if only to go to HEB to get groceries. There is always something I can take us to. Library, play dates, World Market runs…because if I sit at home all day trying to keep her occupied and away from the TV and IPAD by my sheer imagination and will power alone…I’ve got no energy left for me. None. Zip. Zero. Skip supper and go right to bed. But if I take her to the park all morning, or to the library, or walking down Market Street staring at expensive clothes I feel silly even LOOKING at, well, it’s all a little more manageable. I say this every stage but the stage she’s at now, right now, so far, is my favorite. (Except for the potty training). We were sitting on the couch (don’t tell Bill) cuddling with Toby when she patted him on the head and said…’So pretty.’ Awww. Yes, yes he is, I said. Then she tapped her knees and looked up at me and said ‘Ellie’s pretty too!’. Awwwwww. I teared up, I did. I told her she was right and she WAS very pretty. AWWWWWW, right!? Melt. My. Heart. Especially because I haven’t felt particularly pretty lately. Mostly round with baby and dark under-eye circles from the heartburn induced insomnia. So, anyway, starting Monday, things will get a few notches harder for me. As always when faced with something unpleasant I put my head down and barrel through and try to see how I can let this make me a better person. I know working mom’s out there with young kids must read this and just want to throw me out a window but…it’s hard at home too. It’s lonely. And in between the melt-your-heart-moments and the gross she-just-peed-on-my-laptop hyper-activity, it’s really boring. Like, watching the same Daniel Tiger show three days in a row boring. Like, you’re talking to your plants about how much water they might need today boring. (No more, no more for god’s sake woman STOP WATERING US DAILY!) Is what they always say back, if you were wondering. So, anyway, I got to go to yoga twice this week, one was free and the other only $5. The universe taketh and the universe giveth back. Lastly, potty training - exhaustion and cabin-fever…I WILL DEFEAT YOU THIS WEEK!! Rah! Really lastly….”Usually the triumph of my day is, you know, everyone making it to the potty.” Julie Roberts. I broke down and bribed my sweet little potty hater with those little candy coated chocolate Cadbury eggs. It worked. She poo-ed in the potty for eggs. A yoga studio just opened on my street and they have drop in classes and I'm so excited to try it out! I'm there with the bribing...! I told her she could have treats, ice cream, mommy would buy her chocolate bars, a Mazda Miata just please, please pee in the toilet!! !